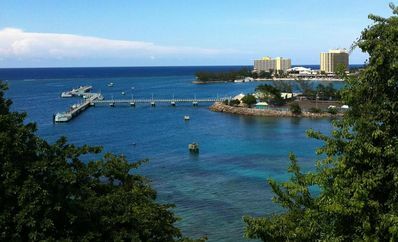 5-10 minutes drive to major attractions like Dunn's River Fall, Mystic Mountain, Dolphin Cove! 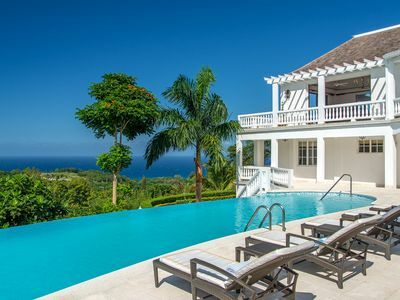 Ocho Rios Pearl (aka “The Pearl”) is a privately owned ocean view two-bedroom Penthouse suite overlooking the resort town of Ocho Rios. 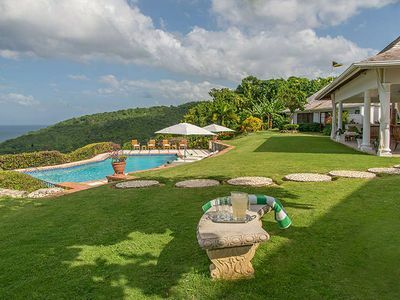 The location is superb; nestled in a tropical garden on the side of the hill in downtown Ocho Rios. Within five minutes walk you will find shopping, restaurants, night club, cinema, you name it. 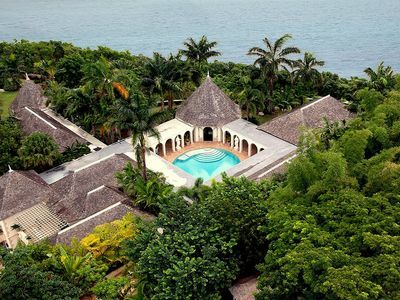 It is also close to Jamaica’s most famous tourist attractions such as swimming with the dolphins at Dolphin Cove, climb the famous Dunn's River Falls or zip lining at Mystic Mountain to name a few. 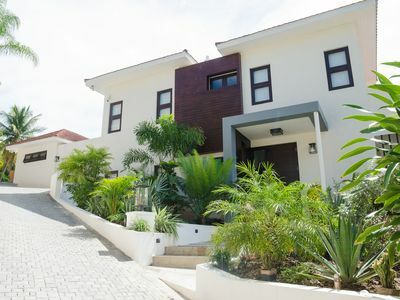 The Pearl is situated in Columbus Heights, a gated and secure vacation rental community with approximately 221 individually owned apartments used by owners as holiday retreats or vacation rentals. 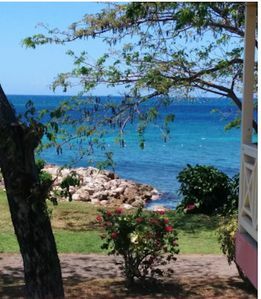 No where in Ocho Rios and perhaps Jamaica have a view quite like this. Come and see for yourself! You will love it. The sea view from The Pearl’s extra large balcony (balcony alone is 360 sq ft!) is nothing short of spectacular. You are so close to the water, you want to reach out and touch. The only thing that separates you from the sea is the hill, a road and some trees. You also have front-row-seats to the Ocho Rios Cruise Ship Pier to watch ships like Carnival Freedom arrive with hundreds of tourists. It is as if the ship is in your living room! Both bedrooms , and the living room enjoy this magnificent sea view. 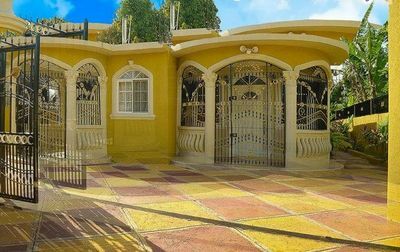 Not to be outdone is the view of the beautiful, well manicured garden and pool from the kitchen, living room and both bathrooms. There is a beautiful view from every room in this Penthouse. 9-5 Services Included: Allow yourself to be pampered by your own personalized housekeeper, cook and nanny every day from 9-5 at no extra cost! That’s right, this service is included! 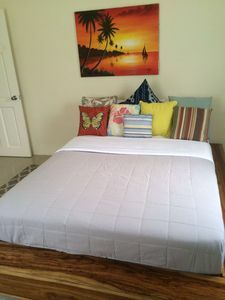 Having personalized staff wait on you everyday adds to the enjoyment of your vacation especially if you are traveling with teenagers, young children or older family members. Your personalized staff will go to the market, buy groceries, wash your clothes (tokens are purchased for the laundry) take care of your loved ones and prepare all you meals. You only need to pay for the ingredients. This saves you hundreds of dollars on the cost of food since you can choose when to eat out! Meals can be arranged in advance for a seamless inclusive experience. 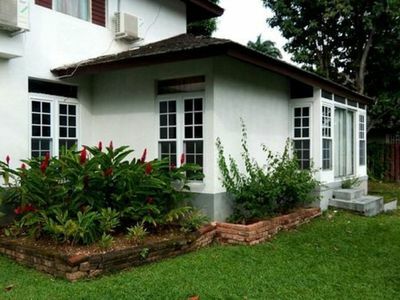 Size: With a total of 1,200 sq ft, you will never what to stay anywhere else! 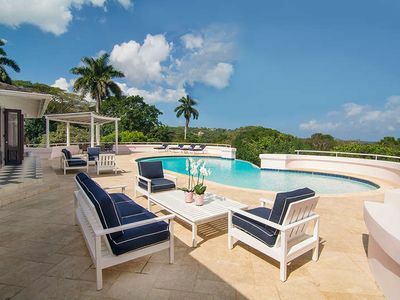 Lot of room to relax and enjoy your vacation. The penthouse is on the second floor and is accessed by one flight of stairs. 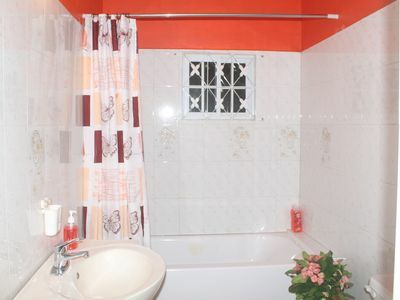 Two Bedrooms and two bathrooms (sleeps 6): There are two bedrooms, each with its own en suite bathroom. 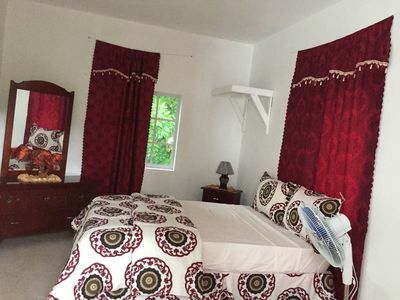 The Master bedroom has a king size bed while the second bedroom has two twin beds that can easily be made into a king bed on request. The Pearl is designed for maximum privacy so that the bedrooms are separated by a large living and dining room. The bedroom sleeps two persons each and there is also a pull out sofa in the living room. 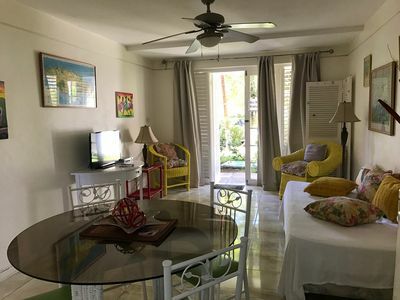 This penthouse is suitable for one large family or two small families who would like to spend vacation together. Full Kitchen: The kitchen includes a full stove, large fridge, microwave, pots and pans, cutlery, dinnerware, etc. All that you need. Your housekeeper can whip up all your meals, if you like, especially if you have dietary restrictions. 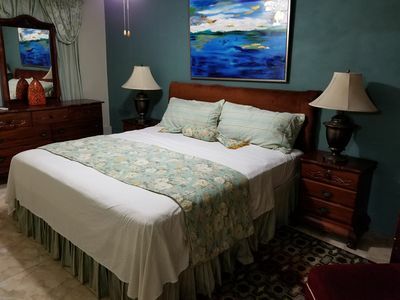 Other features, at no extra charge: Wireless internet Access Included, TV and Blue Wray player with access to free movies included, Magic Jack telephone in master bedroom that allows unlimited free calls to US and Canada. No need to pay expensive roaming charges. We have thought of everything you need! White Sand Beaches: There are two beaches that are just five minutes walk down the hill. There is a beach at Island Village Shopping Centre in front of Jimmy Buffett’s Margaritaville. Only patrons of Margarita Ville get to use this beach. Just buy a drink before you swim. 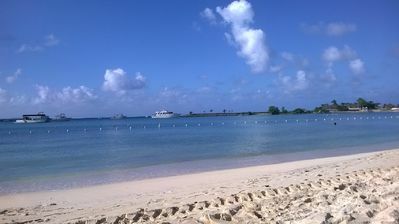 There is also Ocho Rios beach which is a bigger two mile white sand beach. This is a pay per use beach. There is also a marina and boat launch on this beach. 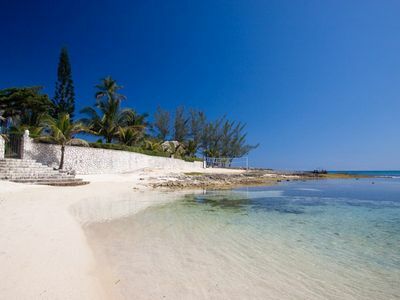 You can access water sports such as jet skies, glass bottom boat rides and scuba diving from this beach. Swimming Pool: The swimming pool is at the bottom of the Penthouse steps right outside your door. 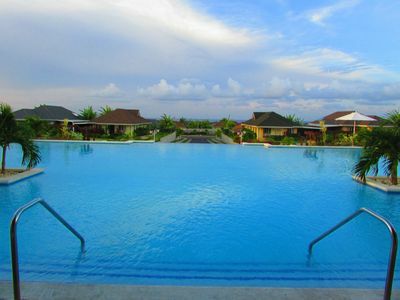 The complex has a total of six swimming pools for your enjoyment. Large Gym: A private large gym is located on site. This is a paid gym, but when you see it, you won’t hesitate to pay the cover for your stay. It has every equipment you can imagine. Laundry facilities: There is a coin laundry facility in the common area on site (not in the Penthouse). 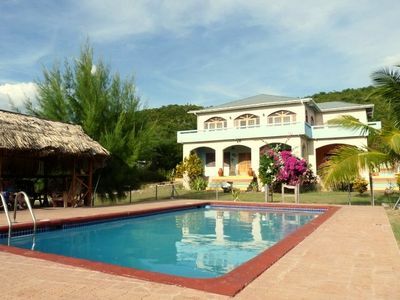 if you a looking for a home away from home to have an authentic Jamaican vacation experience look no further. 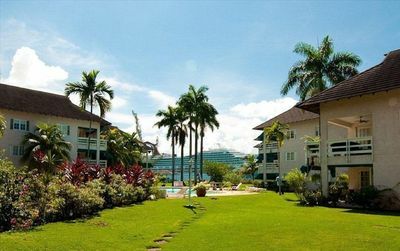 Ocho Rios Pearl has all that you need. 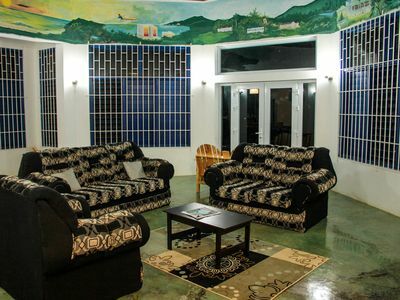 The Rock Villa offers a relaxing and tropical vibe. Perfect for couples and families!